While I love my North Face jacket a lot- it’s not the most fashionable look. It’s perfect for certain occasions (like camping! ), but if you want to be a little more stylish, consider trying a motorcycle jacket like the one on the left. Here I’ve replaced my North Face with this cute Michael Kors motorcycle style jacket. It’s warm and perfect for my casual weekend look. 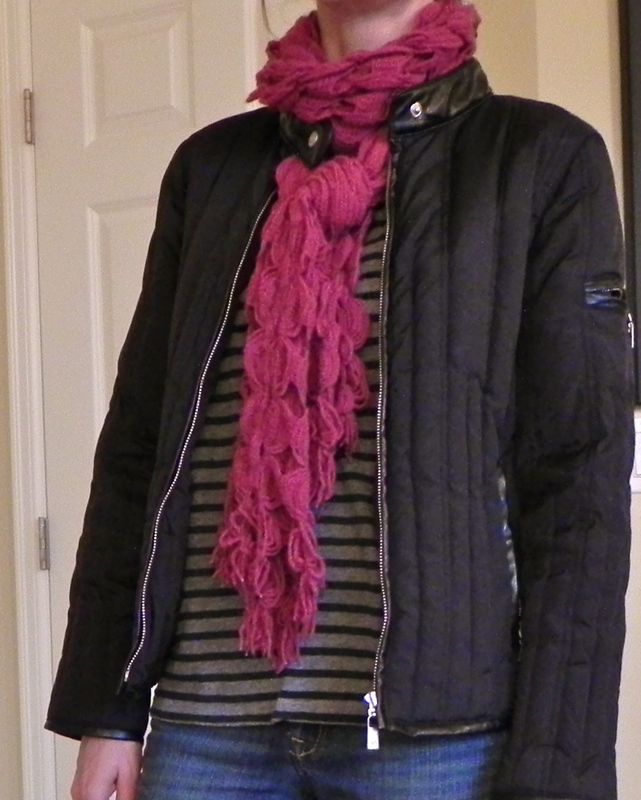 This outfit is really all about the jacket- but in order to look like I’ve put a little effort into my look I decided a striped shirt would be cuter than the plain white one on the right. I also added this bright cranberry colored scarf. I love having just this burst of color- it gives the outfit a focal point. As usual, I’m wearing my black wedge booties. I know, I seem to be wearing these every day, but they are so comfy and I think they are super cute! I love the collar of this jacket. I love these wedges... are you sick of them? Sorry!